Usually, when you have a chart to display, it contains title, chart and legend. For this common case, RadChart provides you with DefaultView. RadChart.DefaultView is of type ChartDefaultView and contains ChartTitle, ChartArea and ChartLegend. 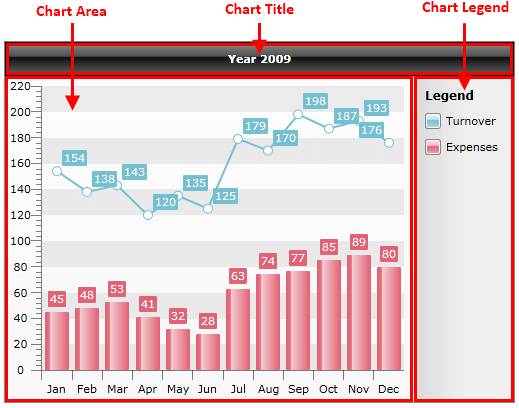 When you create your chart declaratively or from the code behind, with static data or using data binding, the chart is displayed using the default view. However, if you need to customize the layout, use RadChart.UseDefaultLayout property and set it to False. In this case, you have to build the layout you need and set it to the RadChar.Content property as it is shown in Creating Chart with Custom Layout. You can find more information about using DefaultView or a custom layout here: Creating Chart Declaratively and Creating Chart in Code Behind.